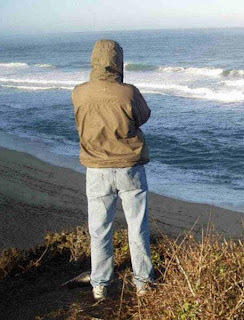 Coping with the grief of losing a loved one is not easy. At our age, many of us would have experienced the pain of bereavement, whether it is the loss of a spouse, a child, a parent, a sibling or a friend. With the passage of time, most of us find the strength to get on with life. But there are some who are so consumed with grief they are unable to function on a day-to-day basis. If unresolved, their grief may result in poor health, depression and even suicidal tendencies. 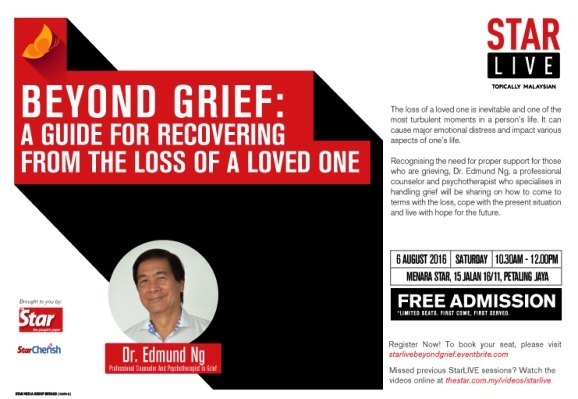 I first heard about Dr Edmund Ng back in 2009 from a newspaper announcement of a talk on grief counselling that he was giving at Bukit Kiara Equestrian Club. Having lost my beloved sister three years earlier, and still hadn't quite fully got over my loss, I decided to attend Dr Ng's talk. I was glad I did. I could relate to everything Dr Ng said - the guilt, the blame, the bitterness and regret that a grieving person experiences when he loses a loved one. Dr Ng delivering a talk on "Helping Your Children Grieve Properly". Dr Edmund Ng is the founder of GGP Outreach. Its tagline is "Grace to Grieving Persons". Having gone through personal loss himself, Dr Ng spoke with conviction and credibility. His audience comprised mostly grieving spouses. Since 2009, Dr Ng has been reaching out to bereaved families with his talks as well as providing financial assistance to help those in need, especially widows. Here is a summary of Dr Ng's Do's and Don'ts for the grieving person based on the talk that I attended. Allow yourself time and space to rest after the funeral activities are over. Accept help from your friends and relatives. Acknowledge that it takes time to heal the pain. Find an outlet to channel your thoughts away from reliving the loss. Take charge of your emotions. Be patient with your children. They are trying their best to cope too. Know that you are not alone. Seek a support group or a counsellor. Don't fall prey to temptations like drinking and taking drugs. Find strength and comfort in God. Keep a journal and record your thoughts and feelings. For more about the event, click on this link.